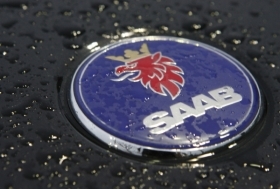 STOCKHOLM -- Saab, which halted production seven weeks ago amid payment disputes with suppliers, aims to restart assembly lines next week, Gunnar Brunius, the manufacturer's production chief, said. Saab is about to start discussions with suppliers to sort out its debts to them and to negotiate future payment terms, Brunius said on Tuesday. "Our ambition is to restart production some time next week, but it's very hard to make a prognosis," he said from Saab's factory in Trollhattan. The cash-strapped manufacturer -- acquired by Spyker Cars NV from General Motors Co. in 2010 - needs to make cars again to generate revenue, as it seeks to stabilize funding. Spyker, based in Zeewolde, Netherlands, said Monday that Chinese auto dealer Pangda Automobile Trade Co. agreed to buy a stake in the company, four days after a deal with Hawtai Motor Group collapsed. "It's paramount Saab restarts production within a week or two because a car company without production is no car company," said Tom Muller, an Amsterdam-based analyst at Theodoor Gilissen Bankiers NV. "The longer you wait with production the more problems you're going to have. The trust in the company from potential car buyers has to be restored as soon as possible." Svenake Berglie, head of Swedish auto supplier group FKG, said it will be up to each supplier to negotiate payment terms with Saab. "Saab's discussions with suppliers haven't started yet as far as I know; we're waiting," he said by telephone today. Saab owes a minimum of 300 million kronor ($47.2 million) to Swedish suppliers and at least as much to foreign component makers, FKG estimates. Brunius declined to comment on the size of Saab's debts. Victor Muller, Saab's chairman and Spyker's chief executive, predicted that Chinese authorities will approve the Pangda deal. "I'm very confident Pangda is well-equipped to ensure the regulatory approvals will be obtained," he said in a telephone interview. "I'm relying on their judgment." Muller also said a top priority in the coming months will be to try to secure a commercial loan that would be used to repay funds to the European Investment Bank. The EIB, the European Union's lending arm, agreed last year to lend Saab 400 million euros, of which 217 million euros has been drawn. The loan, which is guaranteed by the Swedish government, comes with conditions, including restricting use of the funds for specific engineering projects. "After the Pangda deal is implemented, my focus is going to be finding a new CEO and getting a commercial loan to take out the EIB," Muller said. "We cannot be dependent on the government or the EIB for whatever we do with the company. We have been paralyzed, we cannot move left or right." On April 4, Muller said the supplier issue was "under control," only to see production halted again the day after. Assembly lines in Trollhaettan have been still since then. The Swedish manufacturer is also trying to bring in Russian banker Vladimir Antonov as an investor. Saab's former owner, GM, tentatively agreed on April 28 to allow Antonov's investment.